Lisa Mladinich is an amazing woman and an amazing catechist. Her website by the same name - devoted to helping catechists (parents teaching their children about the faith also fall into that category!) was recently redesigned and has lots of great information. Check out Amazing Catechists today! Book Review: "The Christmas Shoppe"
In my annual quest for Christmas stories to help get me in the holiday spirit, it was a delight to discover author Melody Carlson. When eccentric Matilda Honeycutt, known for her odd hair, clothes, and hoarding habit, plans to open a Christmas Shoppe in Parrish Springs, the business community is very nervous. City manager Susanna Elton attempts to befriend her, even volunteering her mother-in-law and young daughter to help her get ready, but the true identity of the store remains a mystery. When she opens for business, everyone's worst fears are confirmed - there are strange sayings painted on the walls and the shelves are full of broken, worn-out items that no one would ever want. Or would they? It turns out Matilda has a much bigger mission in mind than simply moving merchandise and her efforts will help bring healing to many in the small town. This is a charming Christmas story. It is short (this is a plus in my world!) and a quick-read, but it will make you think about the areas of your own life that could use some healing. What do You Want Most for Christmas? It is time once again for the Christmas Novena. It begins on Wednesday, November 30th and goes through Christmas Eve. It is time to prayerfully consider what we want most for Christmas this year and bring those desires to God. I've seen different versions of how to say this novena - some say to say it 15 times a day while others have it as just once a day. However you do it, humbly request God for the blessings that you desire most this Christmas. To hear my prayers and grant my desires. Through Jesus Christ and his most Blessed Mother. Amen. The Catholic Writers Guild, an organization founded to promote and nurture Catholic writers and their work, is gearing up for the second annual Catholic Arts and Letters Award (CALA) for Fiction. The CALA for Fiction is awarded to authors of works of fiction in which judges find exemplary literary merit. All submissions must first be awarded the Catholic Writers Guild’s Seal of Approval, a process by which books are reviewed by a Catholic panel to certify that content does not disregard Catholic doctrine. At last year’s CMN, the CWG awarded the first CALA for fiction in two categories. In the children’s fiction category, Regina Doman was awarded for her young adult novel, Alex O’Donnell and the 40 Cyberthieves. In adult fiction, it was awarded to Michelle Buckman for her novel, Rachel’s Contrition. Regina Doman was equally thrilled to be awarded the CALA in the Children’s division. "Catholic fiction for children and young adults provides entertainment that also reveals faith at work in our lives, and this award will hopefully make more people aware of all the great books available. I am grateful and honored to be the first to receive this award." The deadline for 2011 book submissions is January 31, 2012. Details can be found at the CWG website – www.catholicwritersguild.com. Yesterday, I was blessed to witness this amazing sunrise. While the picture can't fully capture how breathtaking it was, I still wanted to share it with all of you! God is truly the most amazing artist! 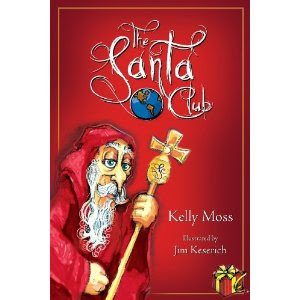 This year, Kelley Moss, a national speaker on “The Gift of Giving,” published The Santa Club , designed for parents and children to read together when the time is right. Beginning with the Biblical quote, “It is more blessed to give than receive,” (Acts 20:15) the book helps to foster generosity in children. It even contains a certificate at the end to officially designate a child as a member of the secret organization. The Santa Club has met with wonderful reviews, even winning a Mom’s Choice Award, awarded to those who create family-friendly media resources. African Nativity scenes are on display at the Knights of Columbus Museum’s annual Christmas exhibit Nov. 15 – Feb. 5. 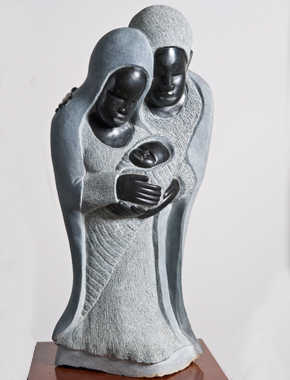 The Knights of Columbus Museum presents its seventh annual crèche exhibition, Christmas Across Africa, Nov. 15, 2011 to Feb. 5, 2012. The display has nearly 100 crèches, statues and other artwork from 23 African countries and tribes, including wood and stone sculptures, Coptic icons, banana leaf Nativity scenes, polished stones and papyrus paintings. The annual Christmas Tree Festival opens Dec. 4 featuring trees decorated with handmade ornaments by regional school children reflecting the artistic traditions of African nations. The Museum, located at 1 State St. in New Haven, is open daily 10 am to 5 pm (though closed Thanksgiving, Christmas Eve and Christmas Day). Admission and parking are free. For info, call 203-865-0400 or visit kofcmuseum.org. Good and gracious God, we come before You today united with all who give You thanks and praise. Fill us with gratitude for Your many blessings, both physical and spiritual. We thank You in particular this day for the gifts of food and family. Bless this food, Lord, that it may nourish our bodies. Bless our family, especially those who can't be with us today. Also today, we remember those of our family who have gone to be with You. Grant us Your spiritual blessings and help us pray daily for the grace to serve You in response to Your bountiful gifts to us. Bless all who serve You throughout the World. We pray this in the name of Jesus, Your Son, Our Lord, who gives all things freely according to our needs. Continue to bless us and give us Your peace. Amen. When we are upset, anxious and complaining about our problems, we are like a parked car. Our Lord can redirect us, but we resist his efforts. However, when we begin praising the Lord for our difficulties, then we are like that car in motion. Praising God for our problems and not despite them does not mean that we necessarily feel elated, giddy, or happy about those problems. We may still feel the same sadness and grief for the difficulty. However, despite our feeling, we can make an act of the will to praise God anyway. The act of the will is what our Lord can more easily redirect. Eventually both peace and joy will return, but they will come not just because we may have gotten what we wanted but because we see God present and active in our lives. I know many of you are very excited about the new English translation of the Mass, but as someone who isn't particularly fond of change, I feel a bit sad about the ending of an era. It just so happened that my younger son was scheduled to altar serve at the 5:30 p.m. Mass on Sunday, so we ended up attending the very last Sunday Mass in our parish with the old translation. It was bittersweet to be there. Our pastor talked about the upcoming changes and we all read over the new placards in the pews that have the new texts. The Mass itself isn't changing, of course, and I understand the reason for the change in the words - the more authentic translation of the Latin text and an increased reverence, but still, the old translation is the only one I have ever known. It is comfortable - an old friend, and I will miss it. I realize that this is nothing like the change my parents went through as young adults when the Mass changed from Latin to English. I also know, in time, the new translation will flow off my tongue (well, perhaps not the word "consubstantial") and someday I probably won't even remember the old version. It will just take some getting used to. But, I wanted to take a moment to acknowledge the end of the old, before embracing the new beginning. Two years ago, I asked many people, both young and old, what they were thankful for in order to compile a list of 100 reasons to be thankful, even in hard times. While some time has passed since I put together that list, times are definitely still hard and the list is definitely still relevant. Looking it over, however, I decided that there were some things I would personally like to add to the list. For many people, this has been the year of weather-related disasters. My own area of western Massachusetts has seen a tornado, microburst, hurricane, and an October snowstorm which caused an incredible amount of damage. The Federal Emergency Management Agency has been here way more than we would like. After losing our power for a full week, this year I am definitely thankful for the basics – electricity, hot water, heat, and being able to do the laundry. I am also incredibly thankful for good neighbors and friends who made going through that experience much easier. I am also very thankful for all the electrical workers and tree-removal people who came from far and wide to help – after the tornado and after the snowstorm. In technological developments, while I don’t personally own either one, smartphones and tablet computers are constantly evolving and changing our world. I’m thankful for them as well. I’m also thankful for more traditional means of getting information. I still love to read my newspaper every morning and my children enjoy the comics. I hope that they continuing publishing for a long time to come. That being said, I now offer you the original list. I encourage you to add your own reasons to be thankful in the comments section. No matter how hard life gets, we all have much to be thankful for. I wish you all a very Happy Thanksgiving! I am thankful for . . .
1. The health of my family. 2. Taking naps on the couch or in the backyard. 3. Driving the scenic route. 4. Community events open to the public. 5. My (flawed) relationships with God and my family, both immediate and extended. Flawed relationships are much better than none at all! 6. My wife and I have grown together and I am constantly grateful and impressed as she matures. 7. The Word of God. 8. Brief and productive meetings. 9. Quilts and blankets, to keep me warm. 10. My wonderful family and for my best friend, who has always been there with quiet support, encouragement, and words of wisdom, through thick and thin since the day we met. 11. The incredible diversity of people on this planet. 12. Co-workers who don't mind switching their days off to help you out. 14. Dirty dishes because it means we have eaten. Thank you for baby giggles; they keep me sane. 15. That God made me. 17. The feel of a child’s hand in mine. 18. Waking up when you need to even when the alarm doesn't go off. 20. The day being silent now that it's over for the little ones. 21. Movies and CDs being available at libraries. 22. The convenience of e-mail. 25. Friends who care about me enough to tell me when I am being stupid. 27. Books, because I can experience the world, learn new things, laugh, cry and connect without ever leaving my couch. 28. My job, especially in this economy. 31. A cup of hot cocoa on a cold day. 32. Family and friends; love them all! 33. The smell of homemade desserts baking in the oven. 34. Listening to beautiful music. 35. Friends meeting over a cup of tea; a fire in the hearth; a friendly game of Scrabble. 36. My kids, who can always make me laugh. 37. Being friends with my parents. 38. Every member of my family, especially for my mom who is a constant source of support, encouragement and friendship. 39. Enjoyable conversation between friends. 41. My family, having a job, having health insurance, and being loved as much as I am. 42. My health, even if I complain about certain aches and pains! 43. My family, my fiancé and being able to go to college. 44. Having a roof over my head. 45. Finding a dollar in an old coat you haven't worn in years. 46. Enjoyable hobbies and pursuits in life. 47. The forgiveness of God. 49. A dictionary & thesaurus, both within arm’s reach. 50. Repairing an object yourself and having it come out perfectly. 51. Hot showers after a hard day of work to ease away the stress of the day. 52. The express line at the grocery store. 53. The generosity of strangers. 54. “Chick Flicks” vs. “Action Movies” and explaining why yours is more enjoyable to the "other team". 55. Tossed aside treasures at tag sales or wherever they may be found. 57. Good role-models we can point to for children to aspire to emulate. 58. Indoor plumbing - imagine life without it. 60. Inspiring words that lift our souls in times of crisis. 61. Youth and amateur sports leagues to both watch and play in. 62. People who obey traffic regulations. 63. The trials and losses in my life for they have helped me become a stronger and better person! 64. Our favorite instructors and teachers. 65. People who enjoy reading what we write. 67. Hidden places that you can sneak away to. 69. Internet Maps and GPS devices. 70. Lucky old coins and favorite treasures, both precious and humble. 71. The spring that will come after the winter. 72. All those who came before us great and small have a story to tell. That is what history is all about. So I am thankful to be able to know and learn their stories. 73. Old libraries and their treasures which lay hidden and wait to be re-discovered. 74. People with interesting personalities who make the world better or at the very least, more interesting. 77. Sitting in an open field on a crystal clear night and enjoying the celestial display above. 78. Our furry four-legged friends who have chosen to live their lives with us. 79. Being able to sit at a computer and just watch music videos when we are supposed to be working. 80. Sunrises, sunsets, ocean waves, hidden forests, mossy rocks and mountain streams and all the other wonderments of nature. 81. Our Guardian Angels who stay with us even when we try to refuse their help. 83. The wisdom of elders. 85. Those perfect parking places which sometimes we are lucky enough to get. 86. The creative minds of others and what they share with us all. 87. Photos, for capturing a moment in time. 88. Relaxing periods of quiet during a busy day. 89. To live in a free country. 90. Bookmarks! No need to fold pages! 92. Social Networking sites. I've always wanted to know what people I haven't seen since grade school are up to. 93. Sweaters, hats, scarves and gloves. 94. Search engine searches that actually turn up useful results. 98. Bread, the universal side to any meal. 99. Buy one, get two free sales. 100. People who commit their lives to protecting and preserving our cities, states and country. As part of the boys' schooling this year, we are reading Stories of the Saints from Catholic Heritage Curricula. I've really been impressed by this book. The stories are very engaging and I've been learning new things as well. 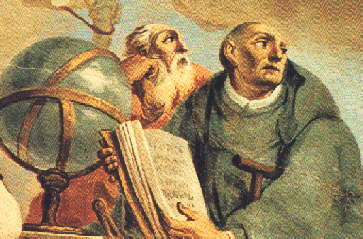 Hermann of Reichenau (1013 July 18 – 1054 September 24), also called Hermannus Contractus or Hermannus Augiensis or Herman the Cripple, was an 11th century scholar, composer, music theorist, mathematician, and astronomer. He composed the Marian prayer Alma Redemptoris Mater. He was beatified (cultus confirmed) in 1863. Hermann was a son of the duke of Altshausen. He was crippled by a paralytic disease from early childhood. He was born in 1013 with a cleft palate, cerebral palsy and spina bifida. [None of the sources cited just the specific diagnosis of spina bifida]. As a result he had great difficulty moving and could hardly speak. At the age of seven he was placed in a Benedictine monastery by his parents who could no longer look after him. He grew up in the monastery, learning from the monks and developing a keen interest in both theology and the world around him. He spent most of his life in the abbey of Reichenau, an island on Lake Constance. Hermannus contributed to all four arts of the quadrivium. He was renowned as a musical composer (among his surviving works are officia for St. Afra and St. Wolfgang). He also wrote a treatise on the science of music, several works on geometry and arithmetics and astronomical treatises (including instructions for the construction of an astrolabe, at the time a very novel device in Western Europe). As a historian, he wrote a detailed chronicle from the birth of Christ to his own present day, for the first time compiling the events of the 1st millennium AD scattered in various chronicles in a single work, ordering them after the reckoning of the Christian era. His disciple Berthold of Reichenau was its continuator. At the age of twenty Herman was professed as a Benedictine monk; he spent the rest of his life in the monastery. He was literate in several languages, including Arabic, Greek and Latin and wrote about mathematics, astronomy and Christianity. He built musical and astronomical instruments and was also a famed religious poet. [None of the references justify the claim that he could read Arabic. There were few Arabic speaking scholars in Europe at this time, and Herman could not have learned by traveling scholars]. When he went blind in later life he began writing hymns. His best known is Salve Regina (Hail Holy Queen). Herman died at the age of forty in the monastery in 1054. The Church beatified him in 1863. I was going through my prayer drawer the other day and came across these two prayers, which had been sent to me from the Friends of St. John the Caregiver. I had never thought of a prayer for care-receivers, but truly, often it is harder to receive help than to give it (at least for me). Beloved St. John, from the cross Jesus entrusted to you the care of His Blessed Mother. Help me and all those taking care of a loved one who is sick, elderly, disabled or frail. Pray for us, that as we go about our many caregiving duties, we may never lose sight of that truth which Christ revealed to His disciples: "Whatever you did for one of these, you did for Me." Amen. My Dear Mother, as you stood at the foot of the cross in need of help, your Son asked St. John to become your caregiver. Be with me now in my time of need. Pray for me and for all care-receivers, that we can accept assistance from others as gratefully and graciously as you did. Amen. This winter, I have two things in my heart and on my mind: caring for those less fortunate than me (or indeed, much of the world) and my DragonEye, PI stories. For Christmas, I’m combining them and would like to share them with you. Those of you who are “Vern Fans,” know about my dragon who works in our world as a private investigator, and his partner, Sister Grace, a mage and nun in the Faerie Catholic Church. They’ve saved the worlds and their friends in numerous stories and novels. Last year, I wrote a story for Flagship about their first Christmas together. Not only is Grace struggling with the Mundane idea of Christmas, but their home is threatened by a land developer who wants to tear down the entire neighborhood and make a mall. When the Ghosts of Christmas come to visit him, however, Vern and Grace have to solve the mystery before the Christmas Spirits become Angels of Death. I have revised and am publishing “Christmas Spirits” as a serial story to raise funds for Food for the Poor. This is a wonderful charity that helps people in impoverished nations help themselves. It allows donators to choose their gifts--whether rice for a family for a month, school supplies, livestock, tools or even houses. I'm asking that you please check out the story, and, if you enjoy it and want to see more, that you donate even a dollar to the cause. Also, if you enjoy the story, let your friends know. I'll post every Tuesday and Thursday as the donations come in. Right now, we have raised enough to send a family 20 baby chicks and are halfway to a fruit tree in addition. Vern would like to send them a cow (he is a dragon, after all), but Sister Grace and I are dreaming of raising enough to buy someone a home. Can you imagine giving a HOUSE for Christmas? Will you help? Find the story at http://christmasspirits.karinafabian.com. You can also get to it via my website, http://fabianspace.com. Look under the Christmas dragon for the link. You can learn more about Food for the Poor at http://www.foodforthepoor.org. If you are shopping Amazon this Christmas. . .
, a great book, or any of the other millions of items available through Amazon.com , please consider clicking through any of the links in this post or the Amazon link on the sidebar. I earn a percentage of each purchase and it helps me keep this blog running! Thank you, as always, for your continued readership and support! I've read quite a few reviews on the new movie "The Way" starring Martin Sheen and Emilio Estevez, but this is the best, most comprehensive, ones I have seen: Martin Sheen and Emilio Estevez on The Way. This is one movie I definitely want to see when it comes out on DVD. Elizabeth Ficocelli (who I wrote about in yesterday's article) will be hosting a brand new radio show on St. Gabriel Catholic Radio. "Answering the Call" is a 30-minute program where she'll be interviewing priests, deacons, and religious sisters and brothers in the Columbus Diocese about their spiritual journeys and their religious vocations. The show will begin airing Saturday mornings at 10:30 a.m., starting December 3, 2011. It will be preceded by Father Larry Richards at 9:00 a.m. and Fr. James Wehner (Rector and President of the Pontifical College Josephinum) with his nehttp://www.blogger.com/img/blank.gifw program, Putting on the New Man: The New Evangelization at 10:00 a.m. It promises to be a great line-up of shows! The launch of Answering The Call comes at a perfect time, when St. Gabriel is on the verge of expanding its signal to reach two thirds of the state of Ohio with a potential listenership of four million people. Catholic radio is playing an enormous role in the evangelization of Catholics and non-Catholics across the country and around the world. If you cannot get 1580 AM on your radio dial, you can listen live on stgabrielradio.com or download archives of many of its national and local programs. How do you think of the Sacrament of Reconciliation? If you are like most Catholics, you probably think of it as little as possible! Or, perhaps, you think of it as something good to have available in the event you do something really, really wrong, but not something you need to concern yourself with otherwise. Or, maybe, you go every year during Lent as part of your Easter duties. You feel it is good to get that fresh start once a year. As hard as it is to believe, the first Sunday of Advent is right around the corner. The start of a new liturgical year is a good time to take stock of one’s spiritual life. What if, this year, you changed how you think about going to Confession? I have been reading Seven from Heaven: How the Sacraments Can Heal, Nurture, and Protect Your Family Today, a soon-to-be-published book by Elizabeth Ficocelli. She discusses many reasons why the Sacrament of Reconciliation needs to play a more important role in our spiritual well-being. The Sacrament of Reconciliation is a sacrament of healing. When we are sick, we seek out a doctor to help us. When we are spiritually ill due to sin, going to Confession helps to heal our soul. It helps to restore our relationship with God, other people, and the Church. As Ficocelli rightly states, “What we do (or what we fail to do) affects the entire community of believers, as well as the spiritual well-being of the Church.” There is no such thing as a “personal” sin that hurts no one but the person committing it. All sin has a communal dimension. We don’t only go to the doctor when we are sick, however. We also go in for periodic check-ups, just to make sure everything is working well and that there are no underlying issues lurking under the surface, waiting to cause problems. So it should also be with taking advantage of going to Confession. Perhaps for this coming year, you could start making going to Confession at least once a month a family affair. Children need to go to Confession regularly just as much as adults do. They need the help that it provides and it is good for them to be in the habit of going to Confession for when the more serious temptations and sins of the teen years come into play. Yes, going to Confession can be difficult. It is humbling and forces us to face our own weakness, but I have generally found that the more frequently you go, the easier it becomes. You start to look forward to that periodic soul cleaning. Attending the Sacrament of Reconciliation regularly is an important part of keeping one’s soul in good working order. Don’t neglect this essential maintenance tool. 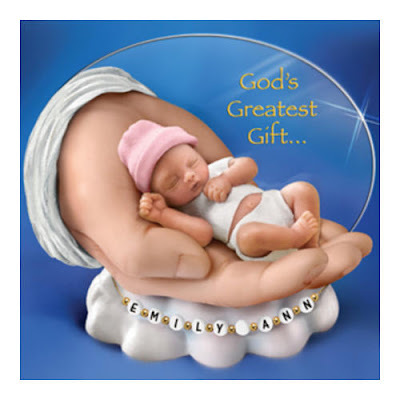 I saw this advertised in a magazine today and fell in love with the image of the tiny baby resting in God's hand. What a beautiful gift for a child's birth or baptism! The National Catholic Register just ran a story on Saintly Tees. Each shirt features a cute illustration with a Scripture verse or Christian saying on the bottom. Sizes available are from newborn to twenty-four months. You can read the article at http://www.ncregister.com/daily-news/saintly-apparel-for-kids1/ or visit the Saintly Tees site at Saintly Tees. They are currently featuring special pricing for Christmas. Many years ago, long before I had ever had children, I had met a man at a work function who spoke about how he still enjoyed reading to his thirteen year-old daughter. At the time, I thought he was a little bit strange. After all, no one in my family had read aloud to me once I knew how to read by myself. I didn't really see the point. Yet, I now recognize the treasure this man had found. My children are 10 1/2 and 9, both are very capable independent readers, and they still ask me to read to them. I enjoy reading to them as well. I always have. I've been exposed to books I might not otherwise have read and gained entrance into the world that captivates their imaginations. By the same token, I've been able to introduce them to some books that might never have otherwise read. It can be easier to tackle a classic when Mom is the one doing the reading. I don't know how long these read-alouds will continue. I imagine the day will come when they decide they no longer want to share stories with Mom, but I will always remember with fondness the times that we shared together curled up with a good book. I hope that they will as well. 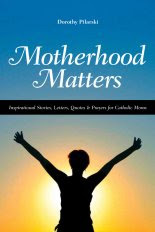 The past couple weeks, I've been reading Motherhood Matters by Dorothy Pilarski. I first "met" Dorothy some time ago when she asked permission to use one of my articles in this book. I happily agreed. Since then, I featured some of her articles on Catholic Exchange and hope to do so on Catholic Lane as well. She is a Canadian mother, writer, television personality, speaker and consultant. Her columns are always thought-provoking. This book is a collection of her essays (and one of mine!) reflecting on motherhood and life as a woman in this century. As she is Canadian, some of the references will seem strange to American women. For example, she expresses sorrow at the fact many women return to work after their one year of maternity leave. Sadly, six weeks is the norm here. How I wish we had such family-friendly policies! While she touches on many other topics (my own article is about looking back at our life of prayer), her primary argument and purpose in writing the book is to encourage mothers to stay home with their children as much as possible and nurture the bond that exists between mother and child. Stay-at-home mothers will feel appreciated, vindicated, and renewed in their commitment to their vocation. The other day, I was half-jokingly trying to talk my friends into doing a reality show about homeschooling moms. Unfortunately, they weren't buying the idea. As one put it, "I'd much rather have people believe the myth." You have heard the stories - you know . . . the family with 12 children, all under age 9, whose 6-year-old has learned to solve three-variable algebra problems by studying the number of Hebrew syllables in the Pentateuch. Their 9-year-old has fully funded his college education by selling organic muffins door-to-door, using the ingredients his 7-year-old sister grew in the 40-acre herb farm she operates. There was enough money left over for Mom to run down to the fabric store (being sure to take all the kids with her so that she could teach a math lesson while buying material). She then bought enough material to make all of the girls matching dresses, all of the boys matching vests, and matching curtains to hang over the kitchen sink. Ummmm. . . maybe not! But that is what homeschooling books and websites can often lead you to believe - that every moment is wonderful, every circumstance a learning opportunity, and that homeschooled children are always happy and eager to learn. The reality on any given day can be far different. As homeschoolers, we are still on the fringe of "normal," even though there are far more of us than they used to be. We are often called upon to defend our choice and to prove our children are doing well in order to silence the naysayers. Therefore, we may be prone to paint a overly rosy picture to the outside world. The truth is, homeschooling does have its perfect moments - moments full of the magic and wonder of learning when everything falls into place and it is all incredibly worth it. But, those moments are the exception. The reality is most of the time, we just muddle through and hope for the best. The grace of God keeps us going through the frustration, the worry, and the whining (both ours and the kids'). Those of us who choose to leave the well-trod path of traditional schooling and jump off a cliff into the world of homeschooling were called to this task. We each have our own stories, our own reasons, our own circumstances. We are all different, but we share a common lifestyle. Even amidst the messiness and the imperfection, it is a good way to live. Perhaps someday, we'll be able to be a bit more honest about what our lives look like and we'll be able to put the homeschooling myth to bed once and for all. Until then, I guess that reality show will just have to wait! November is a month to remember those who have died in a special way. When I got in my most recent Alumni Magazine in, I noticed with sadness that one of my classmates in graduate school - Katie Keator - had passed away. She was only a few years older than I and we were, by far, the youngest students in the program at the time. I presumed she had died of cancer or some other unfortunate disease. He wants people to see suicide as a psychological problem. "It wasn't Katie who killed herself. It was a different person, because the Katie we knew - I don't think she was capable of doing that," he says. . . ."Suicide is a mortal sin but in order to commit that you must have full awareness and consent. How can a person with a mental disorder have full consent?" says Deacon George. During this month, let us remember those who have taken their own lives and their families in a special way. Suicide is so painful, both for those who see no other way out and for those left behind to make sense of it and, with God's help, bring some good out of it. The power came back on last night - after 7 days and 4 hours. It was such a blessing to have heat and be able to do laundry today. Never-the-less, I am mentally and physically worn out so there won't be a formal column this week. I hope to be back to writing columns next Sunday. Thank you for understanding. How many times have you heard an expectant mom say, “I don’t care if it is a boy or a girl, as long as the baby is healthy?” But what happens when the baby isn’t healthy? How does one’s world change when a child is diagnosed with major health issues, either before or soon after birth? Is it worth having a child diagnosed with severe special needs in utero if he won’t live long or will have a poor quality of life? For the contributors to A Special Mother is Born, edited by Leticia Velasquez, the answer to that last question is a resounding “yes.” As a result of her daughter Christina being born with Down Syndrome, Velasquez has become a pro-life crusader, determined to change the statistic that 90 % of children with Down Syndrome are killed via abortion. The parents who share their stories in this book want to educate others about the value and joy of special needs children. There is currently a war going on against special needs children. While those with Down Syndrome have been the primary targets to date due to pre-natal testing, it is only a matter of time before other abnormalities are also targeted. While there are certainly exceptions, the majority of doctors are far too quick to suggest abortion when something is wrong with the baby. They fail to see the blessings and lessons that these children can bring to the world. They fail to acknowledge the inherent worth of every person created by God. We must fight for life for those who cannot speak for themselves. Grab a box of tissues and read A Special Mother is Born. Whether you are the parent of a special needs child or not, these stories will open your eyes and your heart and help you to appreciate the value of every child God sends to this world. Ready to Return to the 21st Century! For those of you who may be wondering where I have been all week, my area was hit Saturday by a freak October snow storm that wreaked havoc and knocked out power for about 100 miles. Power is slowly being being restored, although my particular section definitely seems to be last on the list and I most likely won't have power until Saturday. (I am writing this from the library the next town over which had power restored today. We have been fortunate. My neighbor had a generator which he has shared with us allowing us to have some minimal electricity. We have a gas stove so we could cook and warm the house by having pots of boiling water on the stove. There are many people who have been much worse off. And while local schools were cancelled for the week - we only skipped Monday, although I had them just stick to the basics, so they didn't feel like they were being tortured too much! All in all, though, I can honestly say that I am very ready to return to this century! I am a life-long Roman Catholic, homeschooling mom of two teenage boys and a young daughter, married for 20 years. I am the author of "The Catholic Baby Name Book" and "Letters to Mary from a Young Mother." I have a BA in History and Fine Art and a Master of Arts Degree in Applied Theology. What is a Woman's Worth? Purchases made on Amazon after clicking through a link on this site help support this blog. Thank you! Please consider supporting this site! If this site has been of help to you, please consider making a donation. It isn't tax deductible, but donations of any amount would be very greatly appreciated. Thank you! The FCC now requires book reviewers to disclose the following. Book reviews appear regularly on this website. While there are books that I have purchased or check out from the library that I review, in general I have received the books that I review for free with the understanding that I will review them. There is no expectation of a positive review unless the book is worthy of one, and there is no additional compensation. Amazon.com (Click through to make a purchase and support this site!